Some of you may have noticed my series on openGL with openTK in C# that I wrote some years ago. Since then my life has been quite full of stuff happening so I never got around to look at lightning or other stuff to make sure that I would end up with a working engine. Lately I found MonoGame and started to experiment with it, turns out that it has much of the stuff that I want to use so I ended up writing some stuff with it. 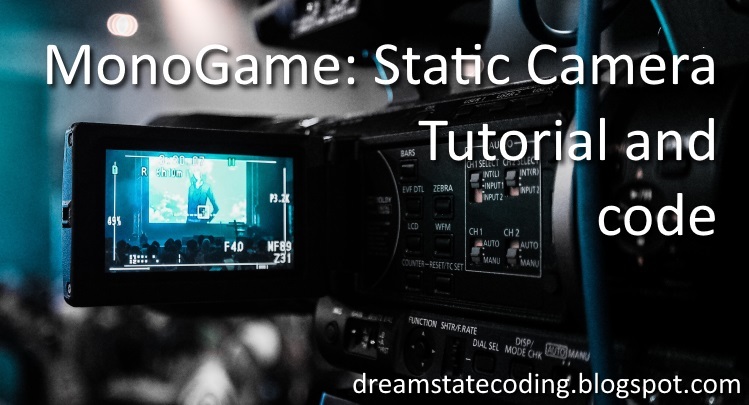 Here I thought that I would share a basic static camera class and its usage as it took some time for me to understand how to get it working together with the BasicEffect class provided by MonoGame. Some code. Let's start to look at the interface that we would want to use with out cameras. We want our cameras to expose their View and Projection matrices as they will be used to integrate the camera with MonoGame BasicEffect. Also, as we will be using this interface with all of our cameras we may want to update it in each frame, hence the Update(GameTime gametTime) method. GameTime is provided by MonoGame and contains two timespans, time since game start and time since last frame. Next we look at the actual StaticCamera, a camera that once created will remain static in the world. I.e. you place it at a position and point it towards something interesting and it will look at that position until you remove the camera. Useful for some scenarios and a good stepping point for creating more advanced camera classes. We want our camera to have a Position in in the game world and a Direction. Also, we want to specify the lense angle in degrees. I.e. 60 degree lense. The near and far clipping planes, i.e. we will only want to render objects that are between those two distances from the camera. The second constructor takes also the position and target to look at. After that we figure out the direction that the camera points at by subtracting the camera location from the target and normalizing the result. To get the ProjectionMatrix we use the Matrix.CreatePerspectiveFieldOfView function that takes the field of view, aspect ration and near/far planes. This is pretty much all for a simple static camera using the MonoGame framework. Next step is to use the camera. I put the above code in my Game1.cs file. As the default Game1 class inherits from Game, it will have GraphicsDevice provided and we just need to send it into the constructor together with field of view angle, near and far planes, position and target coordinates to look at. So each game object has a position in the game world that is stored in Coordinates, it also has an rotation, velocity and scale. Here we can see that the render method takes a graphicsDevice and camera. Here we take the ViewMatrix from the camera and put it in the BasicEffect.View, and the same goes for the ProjectionMatrix that is put in BasicEffect.Projection. The BasicEffect.World receives the rotated, scaled and translated matrix generated from the GameObject. First we tell the graphics device to save some time by culling triangles that are backwards facing, we then clear the scene to a background color. For simplicity we store all our Renderables in a list called _scene and iterate through it and call Draw on each element. I hope this helps someone out there to get unstuck when starting to use MonoGame. The warning was that the _ -> state rule will never match and I started to wonder if there might be a better way to write this thing. For those of you that have read my previous posts about Event Sourcing in F# may notice that the event definition has evolved a little bit since my last post in that series, no worries, I will post more when I have something working. As you can see the ApplicationEvent type is pretty much just a discriminated union of 1 that has a named tuple. 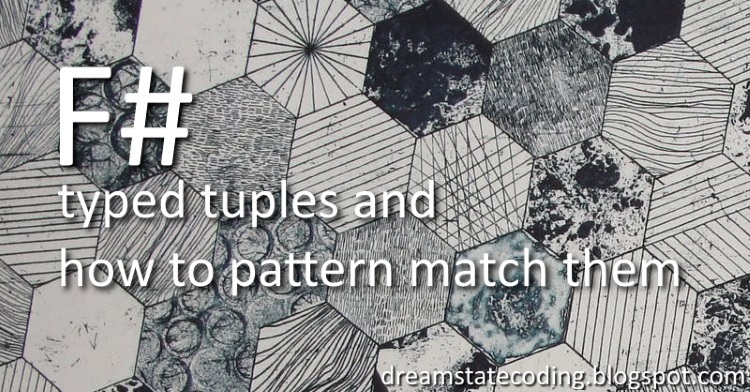 This all makes it easy to handle the application event in the system as one object but when you want to look at the header and payload separately you will have to pattern match it to extract its parts, hence the pattern matching in the function above. I.e. I pattern match already in the in parameters to the function and thus get rid of the whole match construct in the function, and it works! A day when you learn something new is not a wasted day! So hope this helps someone out there! Install both and start Unity. Name the project and select where it should be placed on disk. 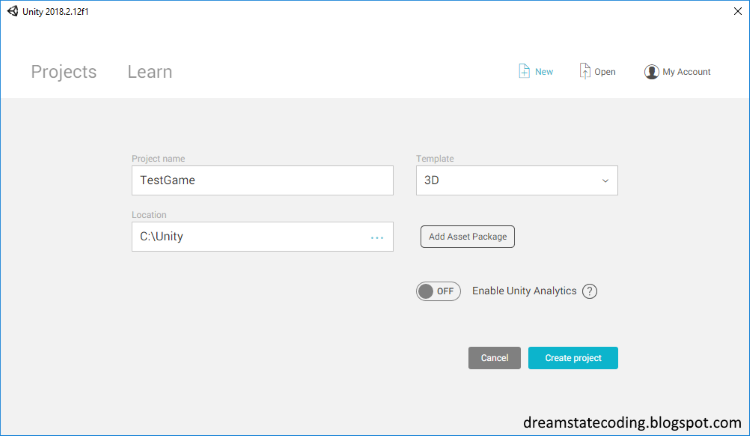 I also disabled unity analytics as I don't think that this test project would have any usage for it. So, how to accomplish logging to screen? Next, let's create the UI component that we will log to. 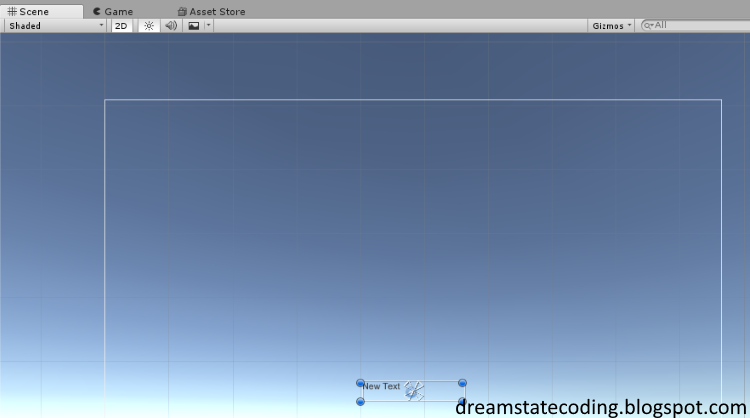 Select the Log Game Object and move your mouse cursor over the Scene view and press F on the keyboard. This will find and focus the view on that particular component. 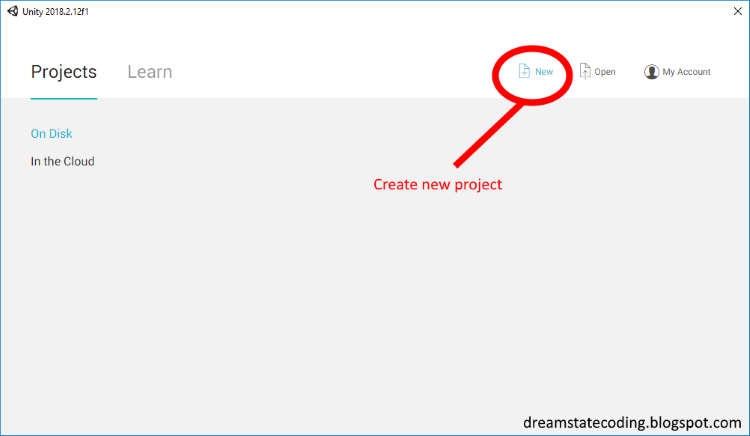 Resize the textbox so that it fills the upper area of the canvas. Notice the color change of the canvas border when the textbox is at the border. So, now we have our UI component setup and placed at the top of the canvas area, lets look at the Logger script. 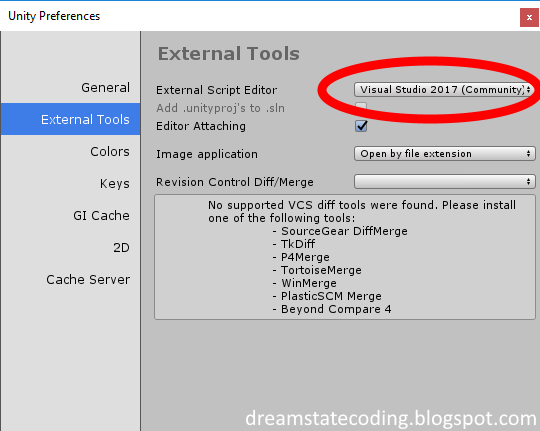 Each script is generated with a Start and Update method. Now, create a new method called Write that takes a string as parameter. Add the input parameter to the list of strings and then we make sure that the list doesn't grow by removing old items if there are more then 3 items in the collection. Lastly we join all strings in the list with a new line between each and assign it to the text field of the Text UI component. And that's pretty much it. You can of course play around with more information but this is the basic logging capability that I am after. Notice the Update method calls the Write each frame, this is only for testing purposes and the whole Update method can be removed once we know that the script works. 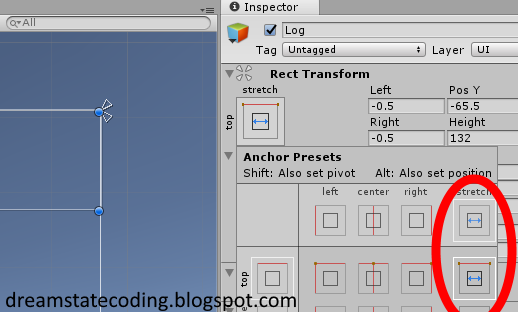 Connect our Log text element to our Logger script in the Screen Logger game object inspection Click on the small circle to the right of the field to popup the Select Text dialog. It will show all GameObjects in the scene of the type Text. So it works, you can now remove the Update method from the script as it is not really needed. ShadowPlay Coding: Let’s Make a 4X Space Game with Unity!